Prof. Dr. Porus S. Turner is Professor of Postgraduate studies in the Dept. of Prosthodontics at A. B. Shetty Institute of Dental Studies, Mangalore, India. He is a Master of Oral Implantology (Msc Implants Ger) from Frankfurt Germany at the Goethe Universitat, Klinikum. He obtained his B.D.S. degree from the University of Bombay in the year 1964 and his M.D.S. degree too from the University of Bombay in the year 1966. 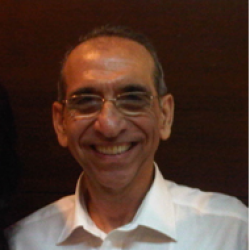 He is the founder member and past president of the Indian Academy of Aesthetic and Cosmetic Dentistry. He has 30 original publications in national and international journals to his credit and has contributed to two books on dentistry. He has authored a book entitled “Art and Science of Aesthetic Dentistry.” Dr. Turner is a fellow of the Academy of Dentistry International and a Consultant to the Bhabha Atomic Research Centre. He lectures extensively in India and abroad on Restorative Dentistry. He was a guest speaker at the 1st International Conference on Adhesive Dentistry held at Tokyo, Japan from 19th to 22nd April 2002. He was invited by Quintessence International to present along with Prof. Shillinburg in Dubai on March 14, 2005. He was invited to give a one-day course for “Beginners in Oral Implantology” in Mumbai on September 24th, 2006. He was an invited speaker at the ICOI World Conference on Implantology held between 29th Nov– 2nd Dec, 2007. He was invited to take part in the World Friadent Congress on Oral Implantology held between 17 – 19 April, 2008. He was invited to take advanced training in Oral Implantology at Frankfurt University under Prof. Nentwig in August 2008. He was invited as a guest lecturer at the Mayo Clinic, U.S.A. to present on the topic, “Immediate Implantation and Prosthetic Rehabilitation”, on May 12, 2009. He was invited to lecture at the 2010 ADA (American Dental Association) Congress held in Orlando USA. His paper “ Implant Aesthetics –It is achievable” was one of the 18 papers out of the 140 , (the only Indian) that was chosen to be delivered . He is recognized as an opinion leader by Friadent Germany to give CDE training in India. He conducts a dental practice in Mumbai giving special attention to Implantology and Advanced Restorative dentistry.